If you’re driving around in a stolen car and would prefer not to get caught (note: don’t do this), the best way to do that is to not attract attention. That would include not asking others for money to fill up a Ferrari 458 at the gas station, since your average Ferrari owner likely, um, wouldn’t. But that’s just what Californian Israel Rangel, 38, allegedly did, after police suspect he took off in the $300,000 car two weeks earlier. The Los Angeles Times reports that owner Susan Friedman dropped it off at a Costa Mesa service center in October and came back to pick it up, but the employees couldn’t find it. 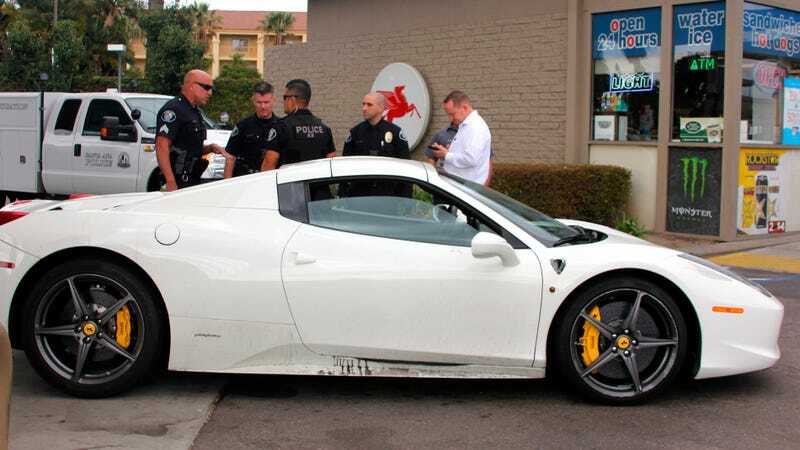 The keys had reportedly been left in the car at one point during its service, and security footage showed a person in a Ferrari jacket walking past shop employees to look in several car windows before driving off in the 458. It was 27 hours before anyone noticed the car was missing, according to the LA Times. The Orange County Register reports that the car was gone for two weeks without being found, before Rangel, whose pretrial hearing is Dec. 18 and who has pleaded not guilty to stealing or vandalizing the car, allegedly began asking for gas money at a local station. The nearly $300,000 exotic car was trashed, with cracked fins, a destroyed gearbox, emblems torn from the engine and body, missing paddle shifters and vomit caked on the side. NBC Los Angeles reports that about $50,000 in damage was done to the car while it was gone, and police said the suspect ran after they arrived at the gas station. He was arrested in some bushes at the entrance to a Holiday Inn, police said. After getting her trashed car back, Friedman’s insurance company wrote her a check for it. She used the money to buy a new Lamborghini Huracan, and told the LA Times she loves it. Deadmau5&apos;s Nyanborghini Purracan Is For Sale You Guys!! !